21 August 2008 marked the 25th anniversary of the assassination of former Senator Ninoy Aquino and the 37th anniversary of the bombing of Plaza Miranda. 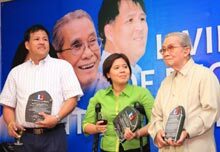 The Friedrich Naumann Foundation for Liberty, the National Institute for Policy Studies and the Liberal Party of the Philippines (LP) marked this day of valor by honoring the LP’s present day heroes of government service: Naga City Mayor Jesse Robredo, former Senate President Jovito Salonga and Isabela Governor Grace Padaca. Liberals gathered at Club Filipino, San Juan to extol their examples of good governance and to applaud their recognition by the Ramon Magsaysay Foundation. Dr. Milwida Guevarra, 2008 Yorac Awardee for Public Service, opened the program by explaining how through Mayor Robredo’s leadership Naga City was able to meet most of the Millennium Development goals. She said that good governance is his greatest legacy to his people. Speaking on the quest for good governance, Kilosbayan Vice President Quintin Doromal introduced former Senator Jovito Salonga as one who has always placed the people first. He talked about the former senator’s remarkable integrity and lauded him for donating his award money to various causes. Former Sen. Salonga (Ramon Magsaysay Awardee 2007) recounted the bombing of Plaza Miranda and how he was critically injured. “My bones have been broken, my hearing and my sight have been impaired. But that does not matter as long as we do not allow them to break our indomitable spirit, and our desire to serve the very poor and the very weak among our people,” he said. Gov. Padaca (Ramon Magsaysay Awardee 2008) said that her award for government service emphasizes the Party’s “efforts to empower people to exercise their democratic right.” It also serves as a reminder that change is possible.